Those really do sound like great reads. Now… which is your favorite bookstore in the city to patronize? San Francisco is such a book lover’s paradise … it’s a tough question! Phoenix on 24th? Adobe on 16th? Dogeared on Valencia? City Lights in North Beach? Acorn over on Polk has closed down … this list is about to get out of hand. I guess if I had to recommend just one bookstore, it would be Green Apple Books over on Clement — it’s what I miss most from my couple of years living over in the Richmond District, and one of my favourite haunts in the entire city. 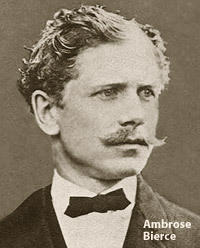 Did Ambrose Bierce write any novels?